Random House Trade Paperbacks, 9780345456885, 304pp. From ancient Rome, where gladiators drank the blood of vanquished foes to gain strength and courage, to modern-day laboratories, where machines test blood for diseases and scientists search for elusive cures, Bill Hayes takes us on a whirlwind journey through history, literature, mythology, and science by way of the great red river that runs five quarts strong through our bodies. Hayes also recounts the impact of the vital fluid in his daily life, from growing up in a household of five sisters and their monthly cycles to his enduring partnership with an HIV-positive man. 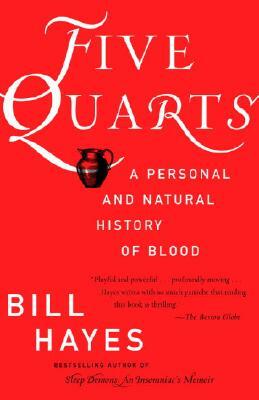 As much a biography of blood as it is a memoir of how this rich substance has shaped one man’s life, Five Quarts is by turns whimsical and provocative, informative and moving. The recipient of a Guggenheim Fellowship in nonfiction, Bill Hayes is a frequent contributor to The New York Times and the author of four books: Sleep Demons: An Insomniac’s Memoir, Five Quarts: A Personal and Natural History of Blood, The Anatomist: A True Story of Gray’s Anatomy, and Insomniac City: New York, Oliver, and Me (coming February 2017), and is currently at work on a new book Sweat: A History of Exercise. A photographer as well as a writer, his photos have appeared in The New Yorker, Vanity Fair, Granta, The Wall Street Journal, and on CBS Evening News. His portraits of his partner, the late Oliver Sacks, appear in the recent collection of Dr. Sacks’s suite of final essays Gratitude.